The gut comprises an essential barrier that protects both invertebrate and vertebrate animals from invasion by microorganisms. Disruption of the balanced relationship between indigenous gut microbiota and their host can result in gut bacteria eliciting host responses similar to those caused by invasive pathogens. For example, ingestion of Bacillus thuringiensis by larvae of some species of susceptible Lepidoptera can result in normally benign enteric bacteria exerting pathogenic effects. We explored the potential role of the insect immune response in mortality caused by B. thuringiensis in conjunction with gut bacteria. Two lines of evidence support such a role. First, ingestion of B. thuringiensis by gypsy moth larvae led to the depletion of their hemocytes. Second, pharmacological agents that are known to modulate innate immune responses of invertebrates and vertebrates altered larval mortality induced by B. thuringiensis. Specifically, Gram-negative peptidoglycan pre-treated with lysozyme accelerated B. thuringiensis-induced killing of larvae previously made less susceptible due to treatment with antibiotics. Conversely, several inhibitors of the innate immune response (eicosanoid inhibitors and antioxidants) increased the host's survival time following ingestion of B. thuringiensis. This study demonstrates that B. thuringiensis infection provokes changes in the cellular immune response of gypsy moth larvae. The effects of chemicals known to modulate the innate immune response of many invertebrates and vertebrates, including Lepidoptera, also indicate a role of this response in B. thuringiensis killing. Interactions among B. thuringiensis toxin, enteric bacteria, and aspects of the gypsy moth immune response may provide a novel model to decipher mechanisms of sepsis associated with bacteria of gut origin. The gut epithelium and its associated microorganisms provide an important barrier that protects animals from the external environment. This barrier serves both to prevent invasion by potential pathogens and limit the elicitation of host responses to the resident microbiota [1, 2]. Dysfunction of this barrier, which can occur as a result of alterations of the normal gut ecology, impairment of host immune defenses, or physical disruption of intestinal epithelia, may lead to pathological states [3–6]. To breach the gut barrier, many enteric pathogens have evolved specific strategies such as production of toxins that physically disrupt cells of the gut epithelium [7–11]. B. thuringiensis kills insects through the production of such toxins, designated insecticidal crystal proteins. Following ingestion of B. thuringiensis by susceptible larvae, these toxins initiate killing of insects through a multi-step process that includes the formation of pores and lysis of midgut epithelial cells [12–15]. Despite a detailed understanding of the mechanisms of toxin binding and disruption of the midgut epithelium, we know less about the subsequent events that cause larval mortality. Three mechanisms, which account for differences among host responses, have been suggested as the ultimate cause of larval death. The first, in which larvae die from toxin ingestion within hours or a day, is attributed to direct toxemia [13, 16, 17]. The second, in which prolonged feeding on B. thuringiensis leads to developmental arrest and eventual death is thought to occur by starvation [18–20]. The third, and most commonly cited mechanism is sepsis due to the growth of B. thuringiensis in the hemocoel following translocation of spores from the toxin-damaged gut into the hemolymph [12, 13, 21, 22]. However, despite numerous reports of growth of B. thuringiensis in dead or moribund larvae [23–26], there is little evidence of B. thuringiensis proliferation in insect hemolymph prior to death. In addition, the proposed mechanism of death by B. thuringiensis bacteremia is not supported by the ability of cell-free preparations of toxin [12, 17, 27], direct injection of some activated toxins into the hemocoel , or transgenic plant tissue producing the toxin  to kill larvae without the B. thuringiensis bacterium itself. Previously, we demonstrated that B. thuringiensis toxin had substantially reduced ability to kill gypsy moth and three other species of lepidopteran larvae that had been treated with antibiotics, and that ingestion of an enteric-derived bacterium significantly increased lethality of subsequent ingestion of B. thuringiensis[30, 31]. We observed that the enteric bacterium, Enterobacter sp. NAB3, grew to high population densities in vitro in hemolymph extracted from live gypsy moth larvae, whereas B. thuringiensis was rapidly cleared, which is inconsistent with the model of B. thuringiensis bacteremia as a cause of larval death. However, these results did not distinguish between the possibilities that gut bacteria contribute to B. thuringiensis-induced lethality by bacteremia or by another mechanism. There is increasing recognition that an important feature of gut microbiota of both invertebrates and vertebrates is their ability to shape and modulate the host immune response [32–36]. In certain circumstances this effect can become deleterious to the host. For instance, uncontrolled activation of the immune response by enteric bacteria leads to chronic infection and pathogenesis in both invertebrates and vertebrates [37–39]. Interestingly, some recent studies have also linked activation of the immune response of Lepidoptera to ingestion of non-lethal doses of B. thuringiensis. For example, ingestion of low doses of B. thuringiensis by Galleria mellonella larvae increased both oxidative stress levels in the gut  and the phagocytic activity of hemocytes . In Trichoplusia ni larvae, exposure to B. thuringiensis reduced both the numbers of hemocytes and components of the humoral immune response (antimicrobial peptides and phenoloxidase activity) . It remains unclear what effectors trigger this immune modulation, and the contribution of enteric bacteria to this response is not known. Modulation of the host immune response could be an indirect mechanism by which gut microbiota alter susceptibility to B. thuringiensis. As an initial step to distinguish between a direct or host-mediated role of gut microbiota in larval death following the ingestion of B. thuringiensis, we examined the possible association between the host immune response and larval susceptibility to B. thuringiensis. Injections of greater than 107 cells of an over-night culture of either B. thuringiensis or Enterobacter sp. NAB3 into the hemocoel of gypsy moth larvae led to a pronounced cellular and humoral immune response (Figure 1). In hemolymph sampled from larvae 24 h after injection of Enterobacter sp. NAB3, melanization of plasma and aggregation of hemocytes [43, 44] were evident (Figure 1b). Hemocyte aggregation was also observed in hemolymph samples from larvae injected with B. thuringiensis (Figure 1c), though these aggregates appeared smaller than aggregates from larvae injected with Enterobacter sp. NAB3. Hemocyte aggregation was not observed in hemolymph sampled from control larvae (Figure 1a). Effect of intra-hemocoelic injection of Enterobacter sp. NAB3 or B. thuringiensis cells on hemocytes of gypsy moth larvae. (a) 10 μl of PBS, (b) approximately 107 cells of Enterobacter sp. NAB3 or (c) B. thuringiensis (non-sporulated) were introduced into three separate cohorts of 4th-instar larvae (n = 10 each). Representative images of samples from each treatment are shown. To monitor the growth of injected bacteria, hemolymph samples were removed after 24 h and observed by light microscopy at 40×. Hemocytes from uninfected larvae were scattered randomly in the microscope field (a). In contrast, large aggregates of hemocytes were observed in samples from larvae injected with NAB3 (b) and smaller aggregates in samples from larvae injected with B. thuringiensis (c). We examined hemocytes and hemolymph in larvae containing enteric bacteria following oral ingestion of B. thuringiensis cells and toxin (Table 1). Microscopic examination of larval hemolymph revealed that the number of hemocytes declined following ingestion of B. thuringiensis. Defects in larval hemocytes were commonly observed within 14 h of ingestion of B. thuringiensis. This decrease in hemocyte abundance and appearance of defects occurred in advance of larval mortality. At 24 h post-ingestion of B. thuringiensis, larval mortality remained below 10%, even though 75% of samples contained fewer hemocytes and hemocytes with abnormalities (Table 1). Hemocytes from control larvae displayed no abnormalities and no larval mortality was observed (Figure 2; see also additional file 1). The hemolymph of uninfected larvae contained hemocytes, predominantly plasmatocytes and granulocytes, which displayed no abnormal characteristics. Moreover, these plasmatocytes retained the ability to adhere to a glass surface and form pseudopodia (Figure 2, left panel and insets). The plasma of control larvae remained free of debris or discoloration in samples taken over the course of the assay period, and no bacteria were observed over the course of the assay. In contrast, hemocytes from larvae fed B. thuringiensis were greatly reduced in number, lacked adhesive properties, and contained refractive inclusions and signs of membrane disruption (Figure 2, center panel and insets). As the number of hemocytes decreased, the plasma darkened and granular material or debris accumulated in samples (Figure 2, center and right panels). The loss of nearly all hemocytes corresponded with the onset of larval death (Table 1) and the appearance of B. thuringiensis cells in hemolymph samples (Figure 2, right panel and insets). Temporal sequence of effects of ingestion of a low dose of live cell formulation of B. thuringiensis (DiPel 10 IU) on condition of hemocytes and larval mortality in third-instar gypsy moth. a n = 5 for each treatment. Effect of ingestion of B. thuringiensis (DiPel 50 IU) on larval hemocytes. Third-instar gypsy moth larvae were fed either distilled water or 50 IU of DiPel (n = 50). Hemolymph was sampled from a separate cohort of five larvae of each treatment at 0, 14, 24, and 32 h post-infection and examined by light microscopy (40×). Representative images are shown, including magnification of individual hemocytes (inset). No differences were observed among larvae from different treatments at 0 h (Additional file 1). Hemocytes from control larvae are adherent and emit pseudopodia (left panel). In contrast, hemocytes from larvae that ingested B. thuringiensis are non-adherent and contain inclusions (center panel). At the time points sampled, the majority of larvae fed B. thuringiensis were still alive. When present, dead larvae that had been fed B. thuringiensis were also sampled (right panel). 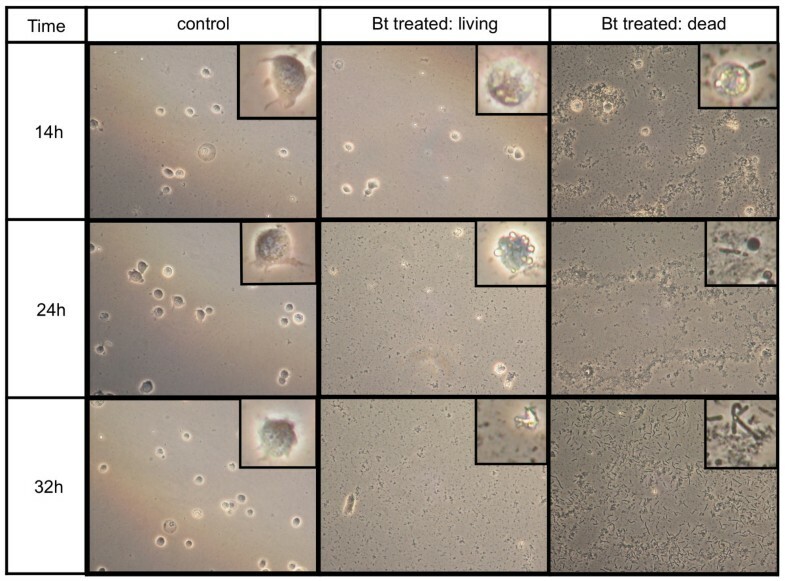 In dead larvae, only a few abnormal hemocytes were detected and B. thuringiensis cells were present (right panel, insets). No mortality was observed in the controls that were not fed B. thuringiensis. Mortality values of control and B. thuringiensis-treated larvae corresponding to each time point are shown in Table 1. Our observation that B. thuringiensis ingestion affected cellular immunity suggested the hypothesis that gut bacteria exert their effect on larval susceptibility to B. thuringiensis in part through stimulation of the host immune response. To determine whether bacterial cell components mediated B. thuringiensis-induced killing, we examined the effect of cell extracts known to trigger immune reactions in many invertebrate and vertebrate hosts, including Lepidoptera, [45–49] on gypsy moth susceptibility to B. thuringiensis. We examined the effect of commercial and purified lipopolysaccharide preparations and various peptidoglycan-derived compounds on larval mortality when co-administered with B. thuringiensis. As shown previously [30, 31], rearing larvae on antibiotics reduced their susceptibility to B. thuringiensis (MVPII, p = 0.0202; Dipel, p < 0.0001, Table 2), and Enterobacter sp. NAB3 accelerated mortality of larvae fed B. thuringiensis plus antibiotics in assays using either B. thuringiensis Cry1Ac toxin (MVPII) or viable B. thuringiensis cells and toxins (DiPel) (Figure 3, Table 2; see also additional files 2 and 3). Feeding peptidoglycan from Gram-negative bacteria, solubilized by pre-treatment with lysozyme, in combination with B. thuringiensis reduced time to death of antibiotic-reared larvae (Figure 3, Table 2). Regardless of the B. thuringiensis formulation, the lysozyme-treated peptidoglycan accelerated mortality of antibiotic-treated larvae, and the effect of the lysozyme-treated peptidoglycan was not significantly different from Enterobacter sp. NAB3 (Figure 3). Restoration of killing by peptidoglycan was not affected by the addition of lipopolysaccharide to either B. thuringiensis formulation. There was no effect of either crude (peptidoglycan-contaminated ) or purified lipopolysaccharide or non-lysozyme treated-polymeric peptidoglycan on larval mortality with B. thuringiensis in antibiotic-treated larvae. Ingestion of monomeric peptidoglycan (tracheal cytotoxin) significantly accelerated mortality of larvae reared on antibiotics and treated with the live cell formulation of B. thuringiensis (DiPel, Figure 3, Table 2), but not with B. thuringiensis toxin alone (MVPII, Table 2). Effects of bacterial cell-derived immune elicitors on susceptibility of third-instar gypsy moth larvae reared without enteric bacteria (antibiotics) or with enteric bacteria (no antibiotics) to B. thuringiensis (Bt). Two formulations of B. thuringiensis, DiPel 50 IU (a) and MVPII 20 μg (b), were assayed. The significance (p-values) of the log-rank test comparing larval mortality of each experimental treatment group to Bt alone or Bt alone when reared with antibiotics is shown. Survival of third-instar gypsy moth larvae reared without enteric bacteria (antibiotics) or with enteric bacteria (no antibiotics) fed bacterial cell-derived compounds and B. thuringiensis (Bt). Two formulations of B. thuringiensis, DiPel 50 IU (upper) and MVPII 20 μg (lower), were assayed. All experimental treatments were provided on artificial diet without antibiotics, gray shading indicates days on which larvae received treatments. The effects of the compounds were assessed in comparison to B. thuringiensis toxin and significance of treatments was determined using the log-rank analysis of PROC LIFETEST (SAS 9.1, Table 2, Additional file 2). Treatments with a survival distribution function that differ significantly from B. thuringiensis toxin alone (p < 0.05) are shown; p-values of all treatments are presented in Table 2. Three independent cohorts of larvae were assayed. No mortality was observed when larvae were fed the compounds alone (Additional file 3). In the absence of antibiotics, larvae were highly susceptible to the live cell formulation of B. thuringiensis and the addition of bacterial compounds had no effect on larval survival rates (Table 2). However, the addition of Enterobacter sp. NAB3 and peptidoglycan fragments derived from bacteria accelerated mortality caused by B. thuringiensis toxin alone (MVPII, Figure 3). Neither preparation of lipopolysaccharide nor peptidoglycan that had not been treated with lysozyme affected mortality induced by the cell-free formulation of B. thuringiensis toxin (MVPII, Table 2). To further test the hypothesis that larval susceptibility to B. thuringiensis toxin is modified by the host immune response to components of enteric bacteria, we fed larvae compounds previously demonstrated to inhibit the humoral and cellular immune responses of insects. Specifically, inhibitors of reactive oxygen and nitrogen species, phenoloxidase, and eicosanoid biosynthesis were fed to larvae to assess their effect on larval susceptibility to B. thuringiensis toxin. Five compounds, acetylsalicylic acid, indomethacin, glutathione, N-acetyl cysteine, and S-methyl-L-thiocitrulline, delayed mortality compared to larvae fed B. thuringiensis toxin alone. None of the compounds significantly affected final mortality and six had no effect on either the final mortality or survival time of larvae fed B. thuringiensis (Table 3). 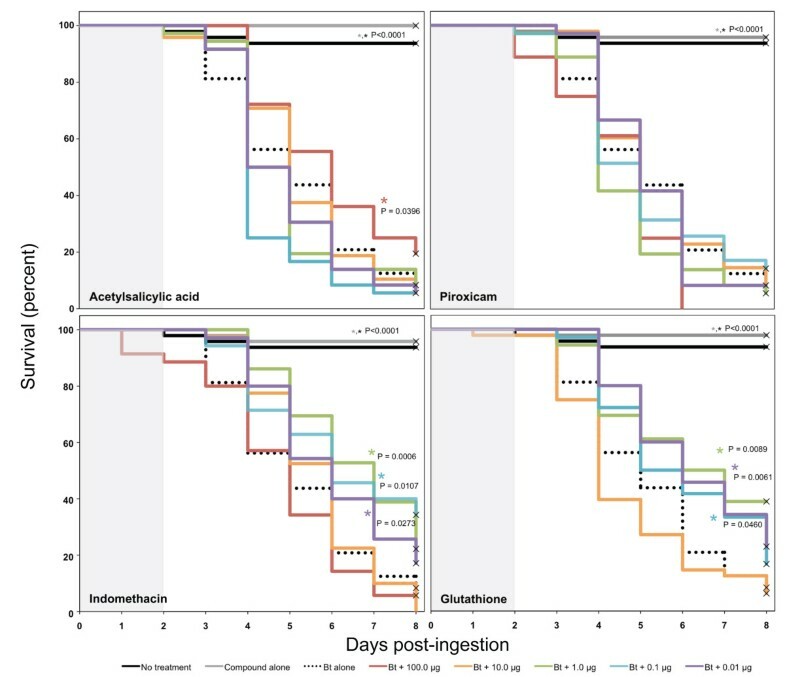 Effect of immune inhibitors on susceptibility of third-instar gypsy moth larvae reared without antibiotics to B. thuringiensis toxin (MVPII; 20 μg). The value N refers to the total number of larvae tested per treatment. There were no effects by these compounds without B. thuringiensis. Log-rank analysis was used to compare larval survival for each concentration of inhibitor, treatments with a p-value < 0.05 were considered significantly different from Bt toxin alone. Mean mortality values followed by the same letter do not differ significantly from each other. Dose-response assays with acetylsalicylic acid, glutathione, piroxicam, and indomethacin demonstrated complex relationships between inhibitor concentration and larval survival (Figure 4; see also additional file 4). Acetylsalicylic acid extended larval survival in the presence of B. thuringiensis toxin, but only at the high concentration (100 μg); the survival time of larvae treated with lower concentrations did not differ significantly from toxin alone. Most of the concentrations of indomethacin and glutathione that we tested increased larval survival time following ingestion of a lethal dose of B. thuringiensis toxin (Figure 4). Survival times of larvae treated with the highest concentrations of indomethacin and glutathione (100 μg and 12 μg, respectively) did not differ significantly from those treated with toxin alone. Effect of antioxidants and eicosanoid inhibitors on survival of third-instar gypsy moth larvae following ingestion of B. thuringiensis toxin (Bt; MVPII 10 μg). Various concentrations of three COX inhibitors (acetylsalicylic acid, indomethacin, and piroxicam) and the antioxidant glutathione were fed to larvae in combination with 10 μg of the MVPII formulation of B. thuringiensis toxin. Larvae were reared with enteric bacteria (no antibiotics) and all treatments were provided on artificial diet without antibiotics; gray shading indicates days on which larvae received treatments. Three independent cohorts of larvae (n = 12-16 each) were assayed. No mortality was observed when larvae were fed the compounds alone (Additional file 4). The effect of the compounds was assessed by comparing survival to B. thuringiensis toxin alone using the log-rank anlaysis of PROC LIFETEST (SAS 9.1, Additional file 4). Treatments with a survival distribution function statistically different from B. thuringiensis toxin alone (p < 0.05) are indicated by *. Four lines of evidence indicate that the innate immune response is involved in B. thuringiensis-induced mortality of L. dispar. First, injections of B. thuringiensis and Enterobacter sp. NAB3 into the insect hemocoel were accompanied by melanization and hemocyte aggregation, both of which are indicators of an activated innate immune response. Second, as demonstrated here and reported by Ericsson et al. , depletion of hemocytes, the key actors of the cellular immune response of insects, was observed following B. thuringiensis ingestion in the absence of bacteremia. Third, fragments of peptidoglycan, an inducer of innate immunity, substituted for Enterobacter in accelerating killing of antibiotic-treated larvae with B. thuringiensis. Fourth, antioxidants and compounds that inhibit eicosanoid biosynthesis, and thereby suppress the innate immune response, delayed B. thuringiensis-induced mortality. Based on these results, we propose the hypothesis that B. thuringiensis incites an overblown innate immune response, in cooperation with other factors, which in turn contributes to host death. This immune induction either requires the normal gut microbiota or is directly suppressed by antibiotic treatment, and is restored to antibiotic-treated larvae by addition of bacteria or immunostimulatory cell fragments. This model is derived, in part, from the mechanism of mammalian sepsis in which gut-derived microbiota serve as both sources of infectious bacteria and modulators of the innate immune system [51–54]. Germ-free mammals are less susceptible to sepsis, just as gypsy moth larvae lacking enteric bacteria are less susceptible to B. thuringiensis[53, 55–57]. Further support for our model can be derived from recent work demonstrating that ingestion of non-pathogenic bacteria can induce the immune response of lepidopteran larvae . This suggests that the microbiota are capable of altering the immune status of larvae without crossing the gut epithelium and could thus influence the host response to pathogenic bacteria. Additionally, Ericsson et al. reported that reductions in the larval immune response following ingestion of a low dose of B. thuringiensis correlated with lower susceptibility to subsequent ingestion of B. thuringiensis. Taken together, these data provide support for the hypothesis that the host innate immune response contributes to pathogenesis and killing by B. thuringiensis. We cannot rule out other factors that might co-vary with innate immunity. Many pharmaceutical inhibitors have non-specific effects on animals that may confound interpretation of the results [59–61]. While eicosanoids mediate various cellular reactions responsible for clearing bacterial infections from hemolymph circulation and are induced in Lepidoptera in response to bacterial challenge [62–64], they also have other physiological functions including ion transport and reproduction [60, 65]. Thus, it is possible that the compounds we used have a direct effect on the health of the insect gut or affect another cellular process that, in turn, influences larval susceptibility to B. thuringiensis. Nevertheless, it is notable that we observed significantly delayed mortality with the antioxidant glutathione and in the presence of diverse compounds that suppress the synthesis of eicosanoids. The immune-suppressive compounds inhibit a variety of enzymes in eicosanoid biosynthesis, and all delay killing by B. thuringiensis, reducing the probability that the biological effects are due to a secondary activity of the pharmaceuticals. Moreover, peptidoglycan fragments, which induce the innate immune response, caused more rapid mortality in insects that had been treated with antibiotics. Similarly, there is growing evidence that diverse classes of antibiotics, including the four used in this study, have immunomodulatory effects in addition to their antimicrobial activity . While the immunomodulatory mechanisms of antibiotics are not fully understood, there is evidence that some directly reduce the host immune response, whereas others limit the release of immune-inducing bacterial components . Further experiments are needed to fully differentiate the extents to which the reduction in susceptibility to B. thuringiensis when larvae are reared on antibiotics is due to the absence of gut bacteria or an immuno-suppressive effect of antibiotics. In the latter case, the re-introduction of bacteria, such as Enterobacter sp. NAB3, would likely stimulate the host immune response, and thus our current results do not permit us to separate these two possibilities. In either case, an immunomodulatory effect of antibiotics would further support a contribution of the host immune response in larval susceptibility to B. thuringiensis. This is the third study, each with a different lepidopteran species, to report that ingestion of B. thuringiensis leads to alterations in hemocytes [41, 42]. It remains unclear, however, whether the observed changes in hemocytes directly contribute to larval mortality or if they merely reflect changes in immune status. Interestingly, Ericsson et al. reported that T. ni larvae resistant to B. thuringiensis had significantly fewer hemocytes than did susceptible larvae. Further experiments are needed to determine whether hemocytes are functionally required in susceptibility. Such experiments should include a comparison of the effect of ingestion of B. thuringiensis on hemocytes between larvae with and without enteric bacteria. 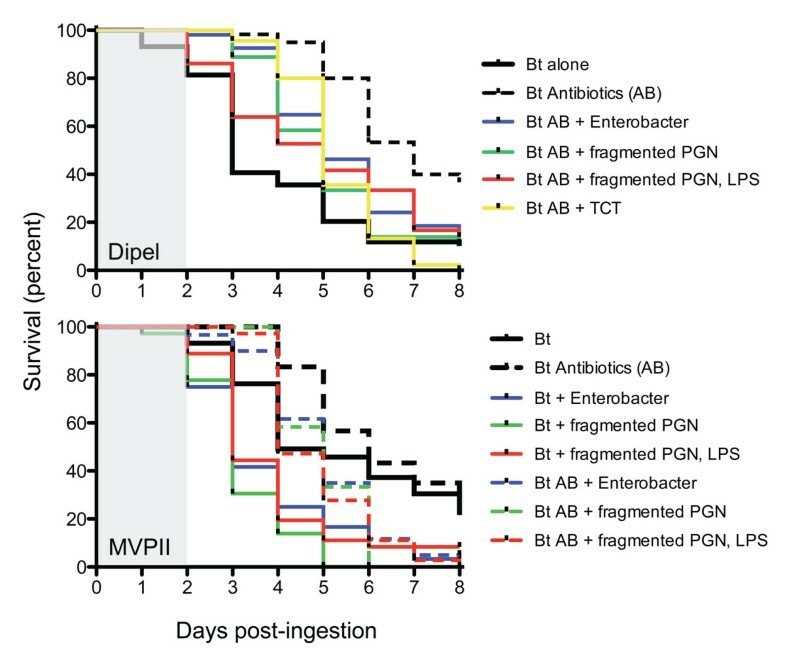 In addition, while our work shows that immunogenic peptidoglycan fragments can restore B. thuringiensis susceptibility in larvae lacking gut bacteria, we do not know whether co-ingestion of peptidoglycan and B. thuringiensis leads to changes in hemocytes, nor have we identified the final immune effectors of B. thuringiensis-induced killing. However, the delayed mortality of larvae fed B. thuringiensis in combination with some antioxidants and eicosanoid inhibitors suggests that production of reactive oxygen species could be involved. Interestingly, hemocytes have been shown to be key regulators of the oxidative burst upon infection, particularly by promoting activation of the phenoloxidase cascade [68, 69], which might be caused by hemocyte rupture [70, 71]. The parallels between the progression of disease and mortality caused by B. thuringiensis with that in mammalian sepsis are noteworthy. Disease and death associated with mammalian sepsis are believed to be caused by uncontrolled host production of local immune mediators leading to local and systemic inflammatory responses [52, 72, 73]. Peptidoglycan induces the innate immune system of both invertebrates and vertebrates [45–49] and contributes to both sepsis and B. thuringiensis-induced killing in gypsy moth larvae. Eicosanoids and reactive oxygen and nitrogen species are critical in the innate immune response in mammals and treatments for sepsis often target these compounds [59, 74–77]. In gypsy moth larvae, inhibitors of eicosanoid biosynthesis and antioxidants prevent or slow disease progress, suggesting a role of innate immunity. There is increasing evidence that diseases of animals are frequently caused by multiple microbial species. These polymicrobial infections often include members of the indigenous microbiota and lead to complex interactions with the host immune system . Using Drosophila as a model of cystic fibrosis, Sibley et al. demonstrated that pathogenicity depends on synergy between Pseudomonas aeruginosa and members of the oropharyngeal microbiota. Even in the absence of infection changes in the gut immune response can lead to pathogenic states associated with an imbalance in composition of the gut microbiota . 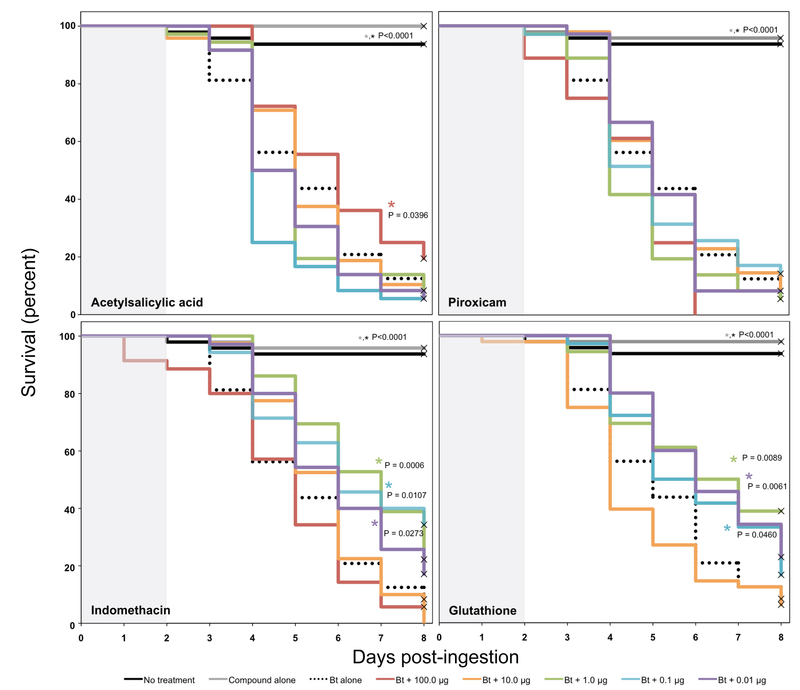 Our results are consistent with the hypothesis that the effect of gut bacteria on host killing following ingestion of B. thuringiensis in antibiotic-treated larvae is mediated by the innate immune response. Further experiments, including direct monitoring of the immune response of larvae, are needed to identify the specific defense responses induced following ingestion of B. thuringiensis and the impact of antibiotic treatment and enteric bacteria on these events. We demonstrate that larvae fed B. thuringiensis die prior to observable growth of bacteria in the hemolymph. An immuno-stimulatory compound, fragments of Gram-negative peptidoglycan, confers B. thuringiensis toxin-induced killing in the absence of indigenous enteric bacteria. Conversely, inhibitors of the innate immune response delay mortality of larvae following ingestion of B. thuringiensis toxin. We propose the hypothesis that the resident gut bacteria in gypsy moth larvae induce an innate immune response that contributes to B. thuringiensis toxin-induced killing, suggesting a parallel with mammalian sepsis in which gut bacteria contribute to an overblown innate immune response that is ultimately lethal to the host. Eggs of L. dispar were obtained from USDA-APHIS. All eggs were surface sterilized with a solution of Tween 80 (polyoxyethylene sorbitan monooleate), bleach, and distilled water as previously described . Larvae were reared in 15-mm Petri dishes on sterilized artificial diet (USDA, Hamden Formula) or sterilized artificial diet amended with antibiotics (500 mg/L of diet each penicillin, gentamicin, rifampicin, streptomycin). Larvae were reared under 16:8 (L:D) photoperiod at 25°C. Two commercial formulations of B. thuringiensis, alone and in combination with various bacterial products and compounds, were used in assays. The DiPel® TD formulation consisted of cells, toxins (Cry1Aa, Cry1Ab, Cry1Ac, and Cry2A), and spores of B. thuringiensis subsp. kurstaki (Valent Biosciences, Libertyville, IL, USA). The MVPII formulation (DOW Agrosciences, San Diego, CA, USA) is comprised of Cry1Ac toxin encapsulated in NaCl-killed Pseudomonas fluorescens. Enterobacter sp. NAB3, a strain originally isolated from the midguts of gypsy moth larvae feeding on sterile artificial diet , was grown with shaking overnight in 1/2-strength tryptic soy broth at 28°C. The overnight culture was washed once and resuspended in 1× PBS (106 cells/μl) prior to use in assays. Lysozyme and lipopolysaccharide from Escherichia coli 0111:B4 were obtained from commercial sources (Sigma-Aldrich, St. Louis, MO). Peptidoglycan-free purified E. coli lipopolysaccharide, polymeric diaminopimelic (DAP)-type peptidoglycan from Vibrio fisheri, and monomeric DAP-type peptidoglycan, also called tracheal cytotoxin, from Bordetella pertussis were kindly provided by the laboratories of William E. Goldman and Margaret J. McFall-Ngai. Peptidoglycan from Bacillus cereus was provided by S. Brook Peterson . The following chemicals were obtained from Sigma-Aldrich, St. Louis, MO: acetylsalicylic acid, dexamethasone, esculetin, glutathione, indomethacin, N-acetyl-cysteine, phenylthiourea, piroxicam, S-methyl-L-thiocitrulline, tannic acid, S-nitroso-N-acetyl-I, I-penicillamine. Fourth instar larvae were anesthetized by chilling on ice for 15 min, then surface sterilized with 95% ethanol (EtOH). Injections were performed with a 20-μl fixed-volume pipette and a snipped 200-μl pipette tip fitted with a 27-gauge needle. The syringe needle was inserted into the ventral abdomen between the first and second pair of prolegs, keeping the needle parallel to the body wall to avoid injuring the alimentary canal. Control larvae were injected with 10 μl of phosphate buffered saline (PBS). Experimental larvae were injected with 10 μl of a washed culture of Enterobacter sp. NAB3 or B. thuringiensis subsp. kurstaki adjusted to a concentration of 106 cells/μl. Larvae were maintained in 15 mm Petri plates by treatment group (n = 10) and provided with unamended sterile artificial diet for the duration of the assay. Hemolymph samples from larvae of each treatment were examined for bacteria 24 h after injection. Hemolymph was collected by piercing the last abdominal proleg with a 27-gauge needle and collecting the hemolymph drops with a 10-μl fixed-volume pipette. Approximately 10 μl of hemolymph was collected individually from five larvae for each treatment and diluted in PBS, 10 μl of which was spotted onto a plate of 1/10-strength tryptic soy agar, while the other 10 μl was placed on a glass slide for immediate microscopic observation. B. thuringiensis mortality assays were performed as previously described . All assays were performed on newly molted third-instar larvae using sterile artificial diet without antibiotics. Either sterile water or 50 IU of DiPel was applied in a volume of 1 μl to a standard diet disk (3-mm diameter, 1-mm height) and fed to larvae. Hemolymph samples were collected as described above for microscopy from five control larvae and five B. thuringiensis-treated larvae at 14, 18, 24, and 32 h after treatment. Additionally, hemolymph samples from 5 larvae were examined at the commencement of treatment (0 h). Additionally, mortality was monitored in a parallel cohort of larvae for the duration of the assay. The effects of bacterial elicitors of the immune response of invertebrates and vertebrates on mortality following ingestion of B. thuringiensis were compared in larvae with indigenous gut bacteria (reared on unamended sterile diet) and axenic larvae (reared on diet amended with antibiotics) using two formulations of B. thuringiensis, MVPII and DiPel. All treatments were applied in 1-μl doses to a standard diet disk and fed to third-instar larvae on two consecutive days, at sample sizes shown in Table 2. All elicitors were tested alone to assess direct toxicity. Lysozyme-treated DAP-type peptidoglycan was prepared by incubating 5 mg/ml peptidoglycan in 1% lysozyme [5 mg/ml lysozyme in 0.1 M sodium acetate buffer (pH 5.0)] for 20 min, followed by heating the mixture at 95°C for 5 min to inactivate lysozyme. The effects of eicosanoid inhibitors and antioxidants on mortality resulting from ingestion of the MVPII formulation of B. thuringiensis were assayed in larvae reared on unamended sterile artificial diet. Each compound was fed alone and in combination with MVPII for two days as described above and mortality was recorded daily for 9 days, at sample sizes indicated in Table 3. Subsequently, a dose-response for four of the inhibitors, acetylsalicylic acid, indomethacin, glutathione, and piroxicam, was established using the same protocol. Mean larval mortality and standard error were determined with data from either three or four replications of 10 to 12 larvae each using PROC MEANS . Means were separated using Fisher's LSD at P = 0.05. The effect of bacterial elicitors or chemical inhibitors on time to death of B. thuringiensis treated larvae was analyzed using PROC LIFETEST . Median survival times and their standard errors were obtained using the Kaplan-Meier estimation and rank analysis of PROC LIFETEST . Survival curves of larvae fed B. thuringiensis toxin and various concentrations of acetylsalicylic acid, indomethacin, glutathione, and piroxicam were compared to B. thuringiensis toxin alone using the rank analysis of PROC LIFETEST . We thank John Tanner (USDA-APHIS) for providing eggs of L. dispar, William E. Goldman (Washington University, St. Louis, MO) for purified lipopolysaccharide and tracheal cytotoxin and Josh Troll and Margaret McFall-Ngai (University of Wisconsin, Madison, WI) for purified V. fisheri peptidoglycan and helpful experimental advice. We thank Peter Crump (University of Wisconsin-Madison) for statistical assistance and Nicolas Buchon (EPFL, Lausanne, Switzerland), Susan Paskewitz (University of Wisconsin, Madison, WI) and two anonymous reviewers for helpful comments on earlier drafts of this manuscript. This work was supported by Hatch grant (#5240) from the University of Wisconsin-Madison College of Agricultural and Life Sciences. NAB performed all experiments. NAB and KFR performed the statistical analysis of the data. NAB, JH, and KFR conceived of and designed the study. NAB, JH and KFR analyzed the data and wrote the manuscript. All authors approve the final manuscript.